Thanks for adding the older concert dates into the Events. Flyer from a show in 2004. Nice to see that the site is adding the older dates to the Events archive. I was able to list the shows I went to in 2000. 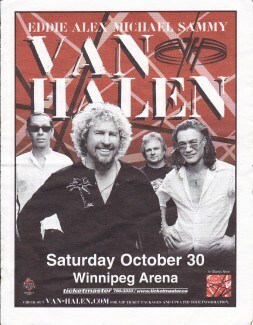 But What about the Van Halen Shows? Don't they count? I saw Sammy with VH 19 times before 2000. Then there is the Sam and Dave Tour in 2002. And VH 2004! This is great that you are listing the older show dates for us. As I was looking at them, I noticed there isn't a date listed for Hara Arena in Dayton, Ohio in July of 1997! This was the first time my daughter & I saw Sammy live & it was a night we'll never forget. I am pretty sure it was on July 27 but a New York venue is listed for that night. We loved every minute of that show & it was that October that we first went to Cabo for a trip of a lifetime for us as mother & daughter! That Dayton show we had just seen was the inspiration for that trip! We went to Hara in Dayton again that November for a free show. Would you please check this out for me because Sammy did indeed play Hara twice that year! Thank-you. I also noticed that there are no Cabo dates listed for 2000. Chrissy & I were at that bash too. Thanks again.